Expedience Excel Connect is a Microsoft Word Ribbon that imports an Excel RFP spreadsheet into a Word Table, allowing you to use the complete functionality of Microsoft Word to an Excel RFP. 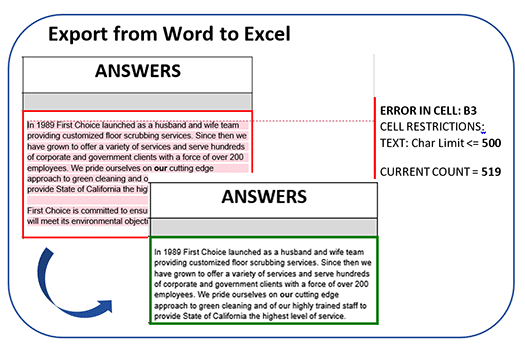 Excel Connect can inspect the Excel RFP worksheet and data restrictions directly from Word, check on the character counts of your answers, and export answers from Word back to Excel. Excel Connect matches the questions between Word and Excel to ensure that the answer is inserted in the correct location, and checks that the answer meets the data restrictions placed on the cell before inserting. Excel Connect verifies Excel Data Restrictions and displays Data Restrictions Errors in Word Comments. Excel Connect applies ‘Excel-Ready’ formatting before exporting answers to Excel, such as applying Excel-compatible bullets and positioning images to appear correctly in Excel.